Forms of protest common to Greenpeace members often involve risk to their own bodies. The head of the Czech branch of this radical organization outlines how to manage a team of such people. Greenpeace is a well-known international ecological organization with a wide range of activities throughout the world. What is the structure of the organization and what are its major activities? Around the world, Greenpeace has 24 registered offices, or, put in better words, action groups. But there are also non-standard registered “offices” in several other countries. So, in total, Greenpeace is active in over 30 countries. 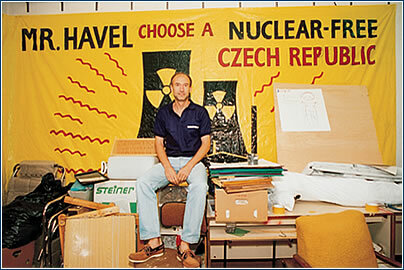 Greenpeace International is headquartered in Amsterdam and its Czech branch was established in 1992. Greenpeace campaigns are generally perceived as well organized, one might even say well directed, with a large media effect. Could you explain to us the behind-the-scenes organization of your team? What you see on television or read in the newspaper is only the tip of the iceberg. The campaigns are preceded by a half year or more of collecting, studying and verifying bits of information which is a time consuming and responsible work the public never sees. Around the world, Greenpeace has about 2.5 million advocates, in the Czech Republic, we have over 10 thousand, and these are the people who support us financially. Besides that, in the Czech Republic we are helped by a group of about 150 volunteers, mostly students who identify with what we are doing. They send out letters, for example, or produce banners and other physical work. The basic team has only ten employees. How do you make your choice among candidates for the basic team? We interview them. We want to find out the motivation for working with us. Of course, we can never be one hundred percent sure that the condition of the environment weighs heavily on their heart. I cannot explain it, I just go with my instinct. We would rather choose the enthusiasts who are zealous about the matter, even if they don’t know too much, because everything can be learned except that which you do from your heart. You manage an atypical assortment of people, many of whom are volunteers. How is this done? One thing is obvious – the management of such a team is different than the management of a firm. I can compare the two because I spent 20 years in business. Here you don’t have the tools that can be used in a firm, and goals cannot be unambiguously expressed in numbers. In addition, almost none of us do it for the money, since you can’t really make a living on it. Our people don’t watch the clock, and, when it is necessary, they work until, let’s say two-thirty in the morning, or on weekends. It follows that in evaluating motivation or when criticizing the team, I cannot follow the general advice that works somewhere else. Of course, this causes problems too. For example, I don’t insist on people sitting in the office – quite the opposite, I like when they work in the field. But then it can happen that people abuse this and end up not doing anything, or no one wants to do the office work. What qualities and skills should the head of Greenpeace have? Primarily, he should be able to introduce a vision of the future to the team and evoke a feeling of certainty that goals with big risks will be achieved. 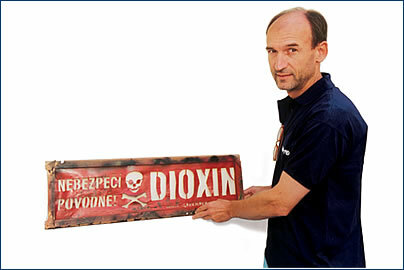 I think that in Greenpeace, and the Czech Republic in general, people suffer from too much caution. When we consider a project, first we calculate and evaluate all the negatives, and we might finally come to the opinion that it is too complicated and probably can’t be done. I try to build the attitude “if we want to do it, we’ll do it and we’ll solve our problems along the way” with my people. This attitude is not common here yet, but it is improving. You said you don’t have any classic tools for motivation, so how do you encourage your team to perform well? Our unit is made up of three sub-groups – and the fourth one, the tiny one, is the director. All these groups must cooperate very intensively. The interaction is irreplaceable and the moment when one of us relaxes his efforts, it reflects in the work of the others. In this case the motivation is that the rest of the team is angry at the person who doesn’t work so hard. I will call it more of a moral motivation than a financial one. Is it a problem for you to fire an employee who doesn’t prove himself? This is a really big problem. I remember a time when I had to fire a member of the basic team because he wasn’t compatible with the others. They had the feeling he was ordering them around and appropriating authority that wasn’t his. I had the same feeling, so I had a serious conversation with him twice. It didn’t help, yet when I said good-bye to him I felt bad about it. Sometimes the public considers Greenpeace to be an extreme group that gets into dangerous actions just for effect. How do the younger colleagues react and what advice do you give them in those situations? Every situation in which the police are involved is stressful for us. It is the sovereign right of each volunteer to say if he wants to get involved in the action or not. He must be prepared for the fact that his face may appear in the newspaper or television, that he may even end up in prison. Two years ago, we were placed under arrest because of an action at the State Office for Nuclear Safety, who didn’t want to listen to our arguments and evidence. The Czechs were released by evening but the foreign participants had to be there until the foreign police came. One of them was even accused of “disseminating public threats”, he was sentenced and deported from the country. Paradoxically, such situations help people to realize that they are fighting for something good. The fact that they end up in prison evokes the feeling that society needs them to not sit at home in slippers but to devote themselves to public matters.